How to Create Your Very Own Fad Diet! Fad diets are so popular right now it would almost be fair to call them a fad. Right now, we are right in the middle of a fad fad, so it’s time to jump on the band wagon! But with so many popular diets to choose from, where do you start? Simple: you make your own! This way, you can create a diet that works for you and you can potentially get rich and famous. 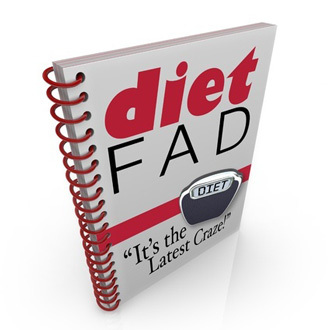 Let’s take a look at some of the steps needed to create a fad diet. Try to avoid any actual journal studies. Instead, make sure that you are getting your news second hand, ideally from the tabloids. Look for animal studies with small sample sizes. Now take the preliminary findings from that study and extrapolate it. Better yet, exaggerate it beyond all reasonable limits. The Bulletproof Diet does this perfectly. After Dave Asprey read that ‘saturated fats’ aren’t bad for you, he jumped to the logical conclusion that he should add at least 2 whole tablespoons of butter to his coffee. So should you learn that iron is good for you, you might want to recommend eating one whole bike. It’s science. Made up science works better if it’s surrounded by a few technical-sounding made-up words as well. For instance, eating more iron will help to counteract the negative effect of Tricyclic Monoenzymatic Calcium Compounds. Also, they’ll increase your Yeth potential. You can also use well-known terms incorrectly, or without any evidence. Words like toxins, mycotoxins, trans fats and detox are popular choices. Randomly think of all the foods you can and write them down. Now put them in a hat. Draw out one of them. That is the enemy from now on. Tell your loyal readers that this one item of food should never be touched. It makes people fat and it causes brain fog. Now you have a great scapegoat for everyone’s problems. Likewise, you should also look for one item of food that is just brilliant. People will be more likely to believe it if that one item of food is something that people don’t like the taste of. No one wants an easy diet. Easy diets are not easy to swallow. The best way to pick your ‘superfood’ is to try talking to some hipsters and seeing what they like lately. Popular options right now include coconut oil, coconut milk, coconut water and kale. Once you’ve got your amazing food, you can now point out how it melts fat. Also, it increases energy. Ah what the hell, it also gives you an amazing tan! Is this diet too generic for you? Instead choose a color then and let this be your ‘hero’. The ‘blue’ diet means you can only eat blue things. People much prefer fad diets if they also believe that they are saving the world. Tout the fact that your diet is also highly eco-friendly because it uses up less land and creates less waste. And there you have it! Your very own fad diet. It’s complicated, it’s backed by science and it sounds just anti-establishment enough that it must be true. Now just stick to it religiously and be incredibly evangelical to ensure it catches on. When it does, you can always move onto something a bit newer and more now. Do Height Increasing Supplements Work?